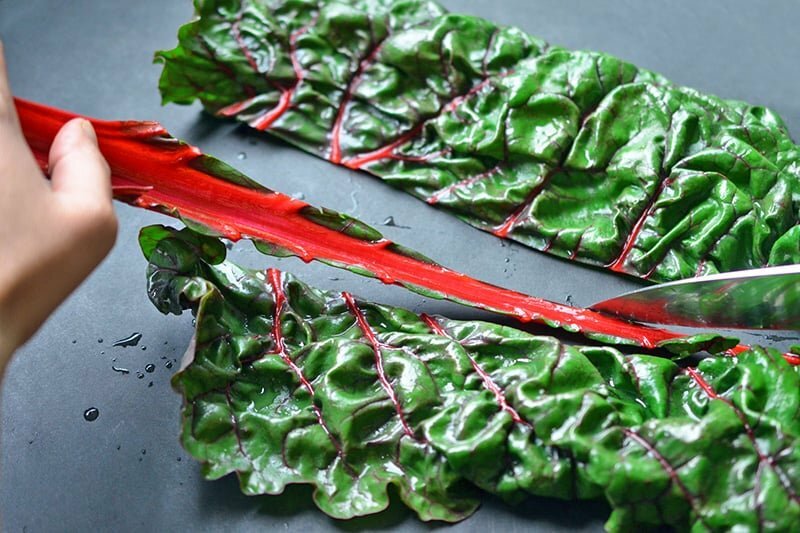 Swiss chard’s like the Amal Clooney of the produce aisle—it’s more than just a pretty exterior. 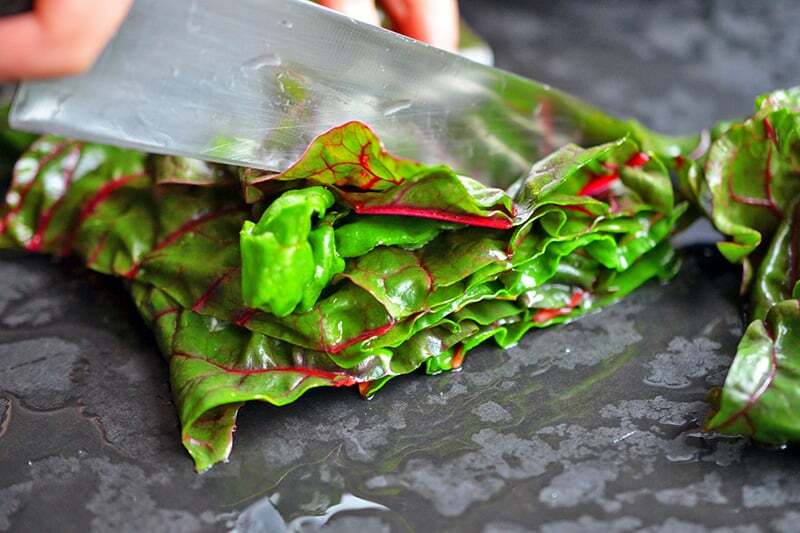 This gorgeous vegetable’s also nutrient dense, quick-cooking, and delicious in so many different preparations. 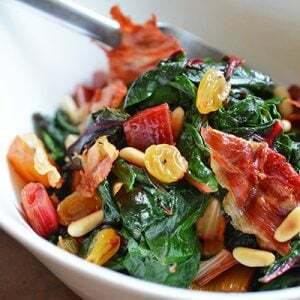 Although there are numerous ways to serve chard, my favorite is the classic Catalan approach, in which the greens are wilted in a pan with sizzling minced garlic and then tossed with toasted pine nuts and golden raisins. I also crumble on a few Porkitos to add a salty, swiney crunch to each bite. 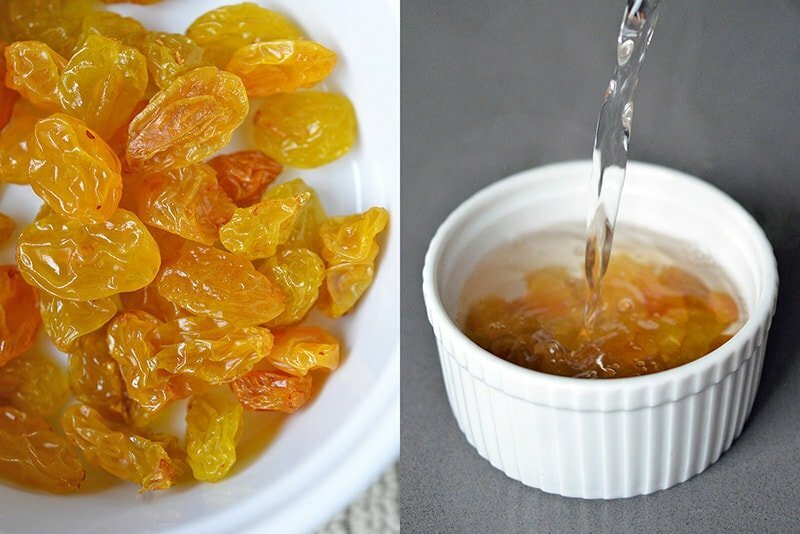 Place the raisins in a small bowl, and submerge in hot water for at least 10 minutes. If you don’t have any Porkitos ready, now’s the time to bake ‘em. 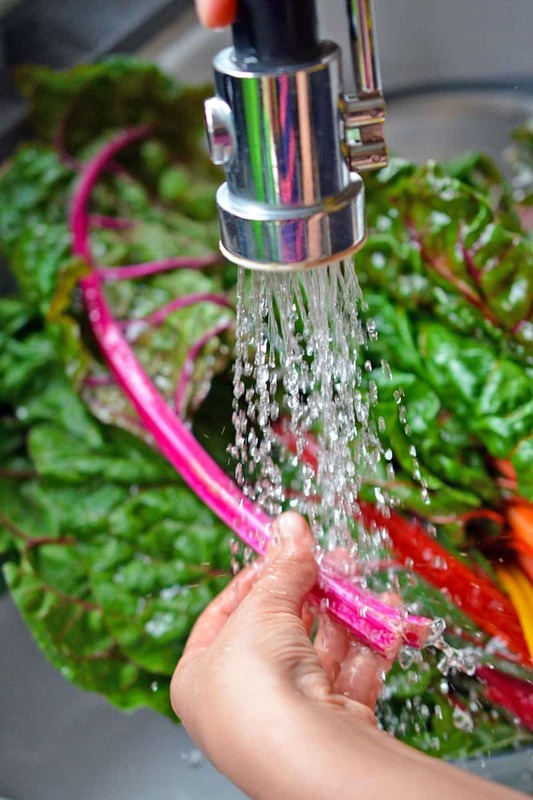 Wash the chard and flick off the excess water. You want the leaves damp, but not sopping wet. 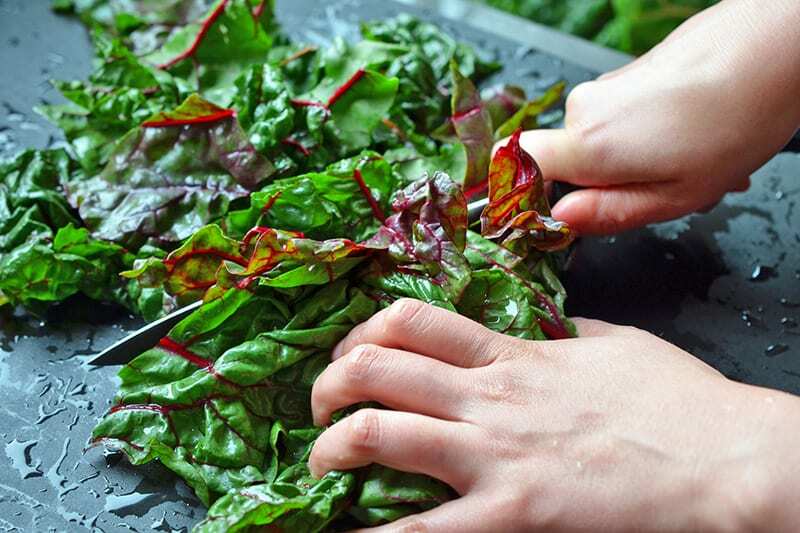 …and roughly chop the leaves into thick ribbons. 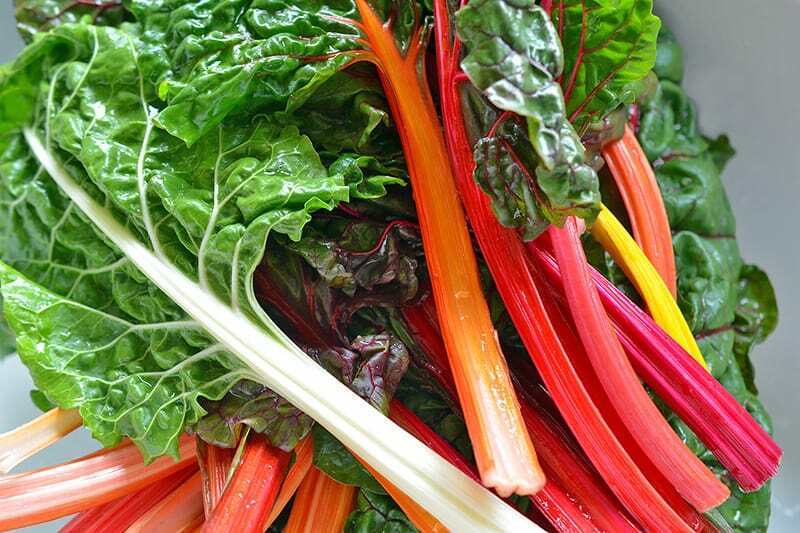 If the stems are fresh and crisp, slice ’em up into ½-inch pieces and discard the ratty ends. 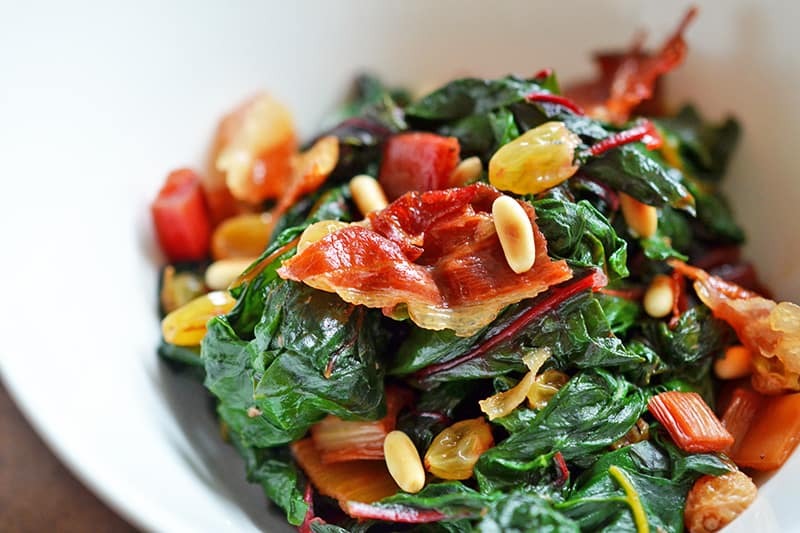 Heat a large skillet over medium heat and toast the pine nuts until golden brown, 2 to 3 minutes. 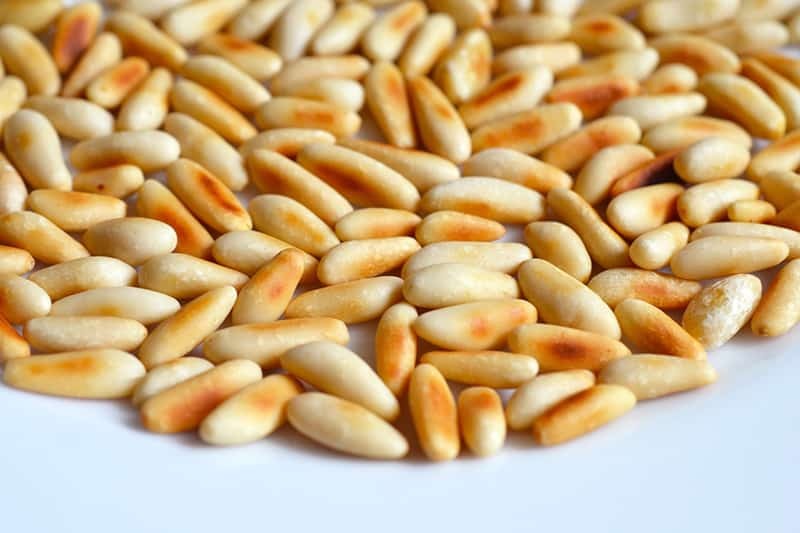 Transfer the pine nuts to a plate to cool. 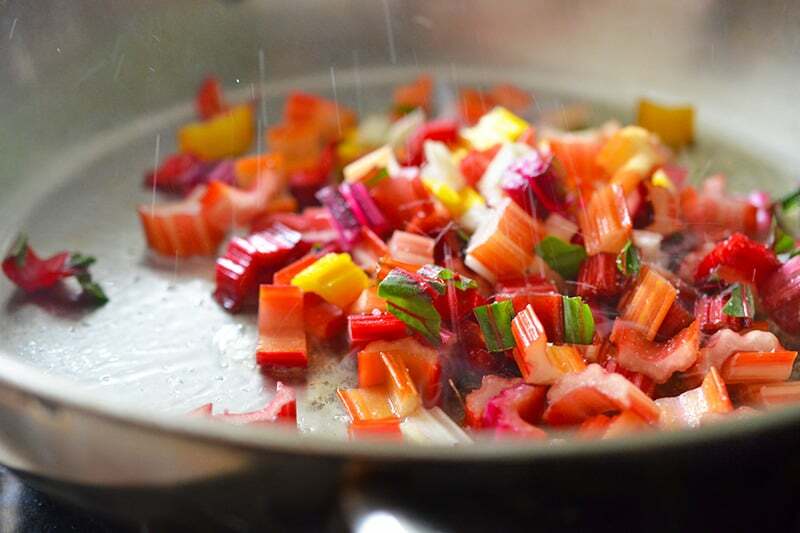 Increase heat to medium high and add 2 tablespoons of ghee to the skillet. 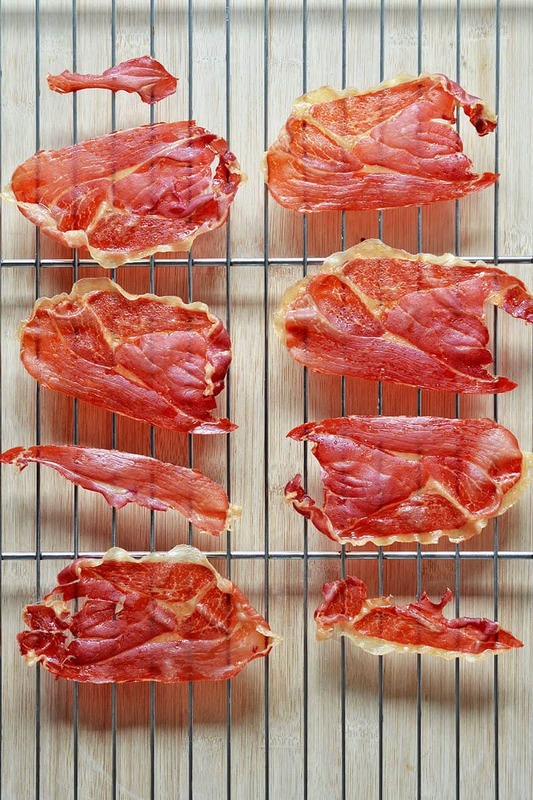 When the fat’s shimmering, add the stems with a sprinkle of salt. Add the minced garlic to the pan and stir for a few seconds until fragrant. 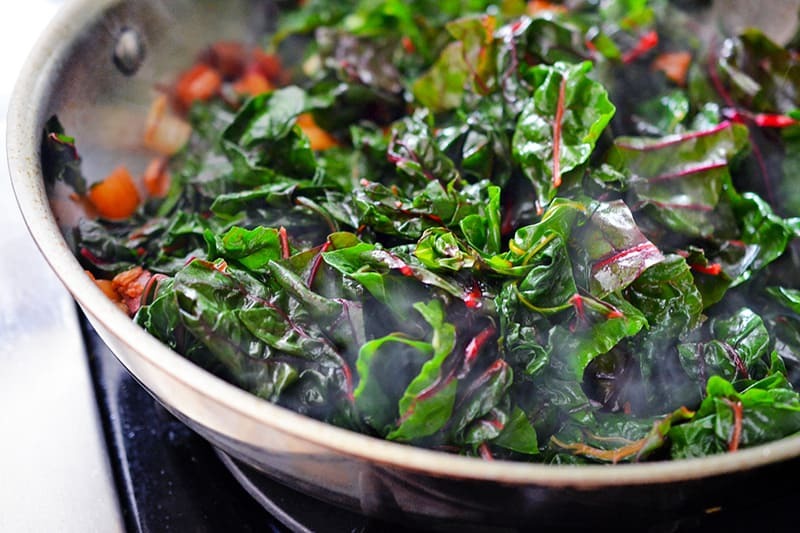 Then, add the damp leaves in batches, each with a sprinkle of salt. Don’t worry if you can’t get all the leaves into the pan all at once. 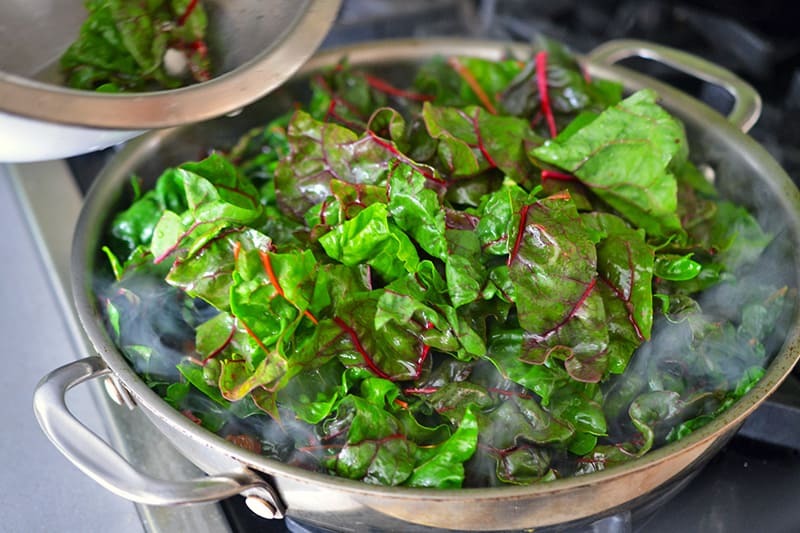 The leaves will wilt and cook down, and eventually you’ll get all the greens in the pan. Drain the plumped raisins, and toss ’em in. Give everything a good stir, and cover the pan. Decrease the heat to medium and cook, covered, for 2 minutes or until tender. Season with salt and pepper to taste. 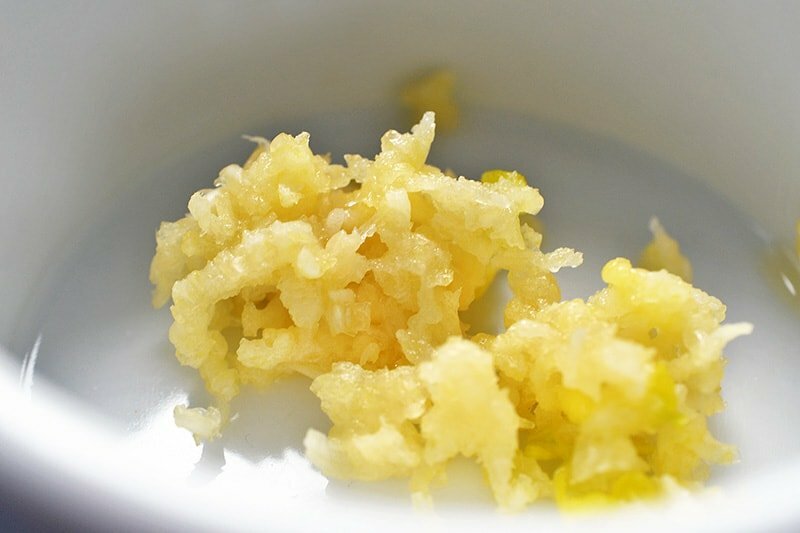 Toss in the pine nuts, squeeze on the lemon juice, and crumble on the Porkitos. This hearty Whole30 vegetable side dish is packed with flavor, textures, nutrition, and crispy pork! 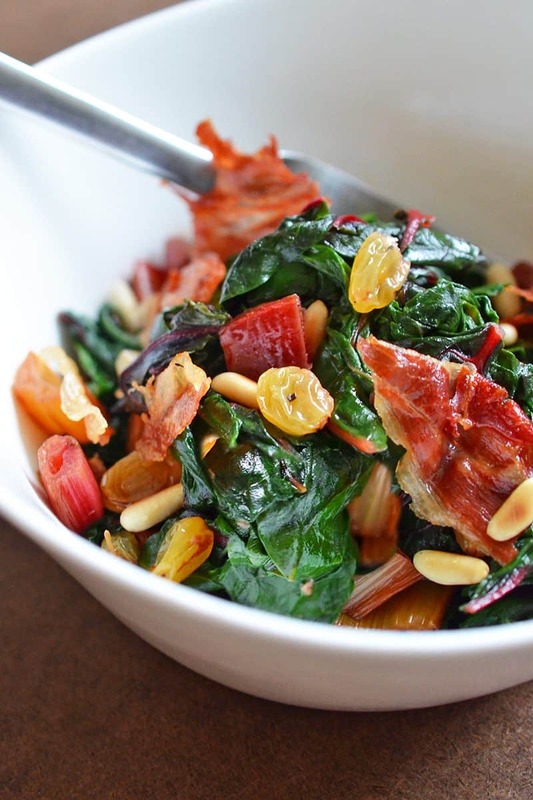 It's one of my favorite ways to serve Swiss chard! 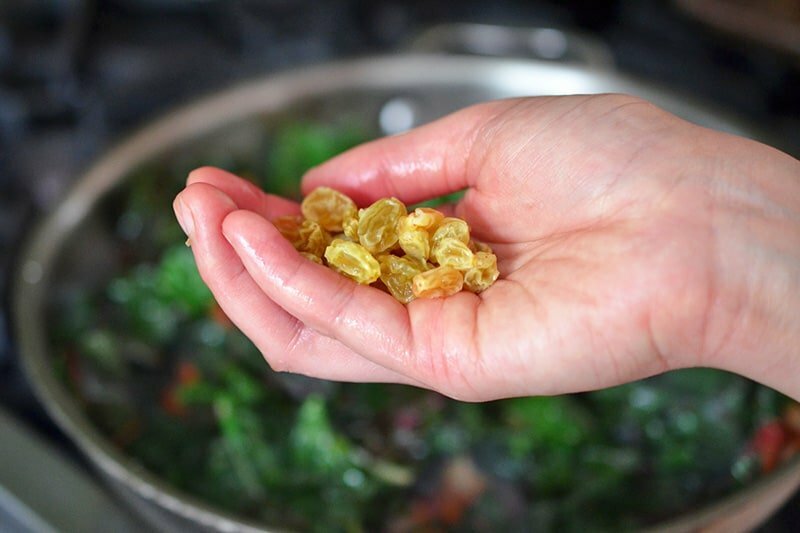 Place the raisins in a small bowl and submerge in hot water for at least 10 minutes. Cut out the stems and roughly chop the leaves into thick ribbons. 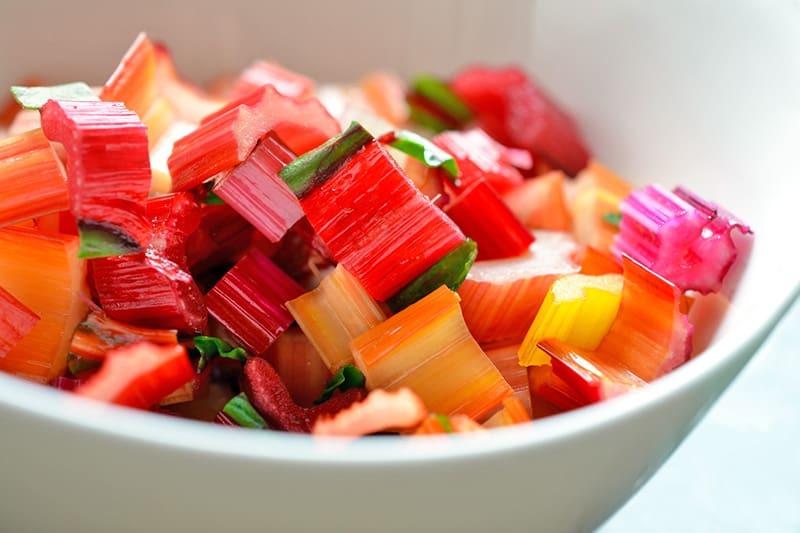 If the stems are fresh and crisp, slice ’em up into ½-inch pieces and discard the ratty ends. Heat a large skillet over medium heat and toast the pine nuts until golden brown, 2 to 3 minutes. 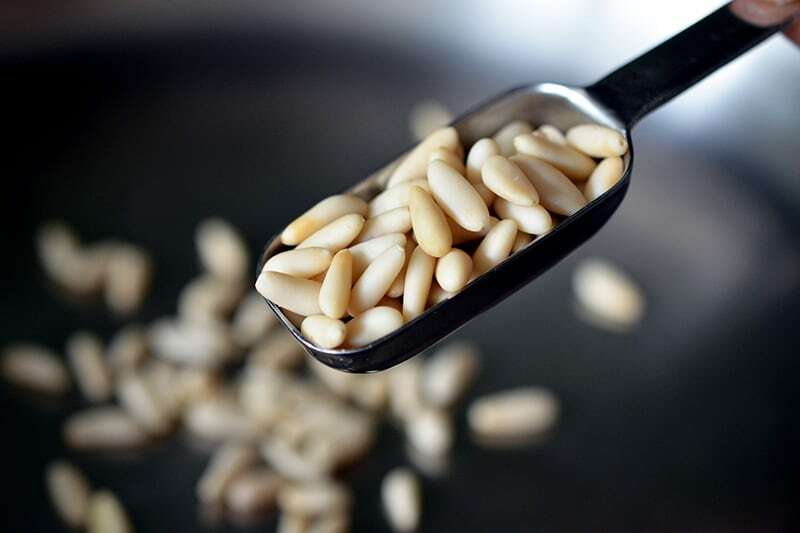 Transfer the pine nuts to a plate to cool. 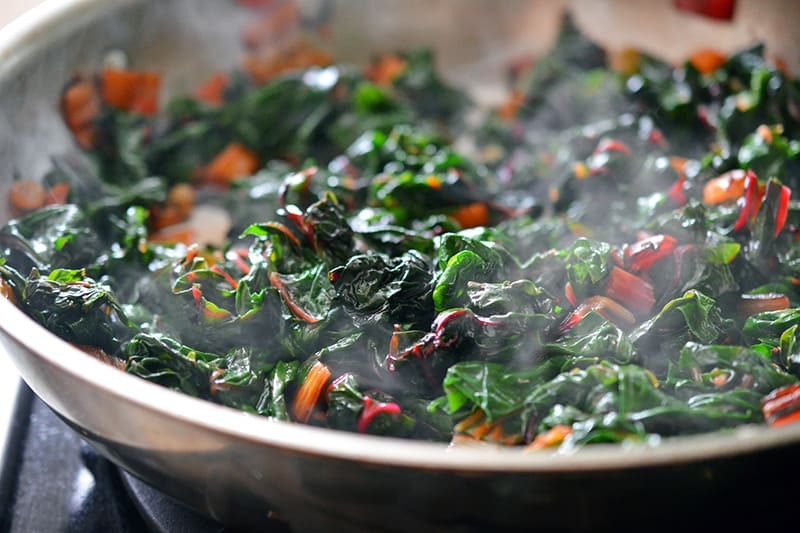 Increase heat to medium high and add 2 tablespoons of ghee to the skillet. 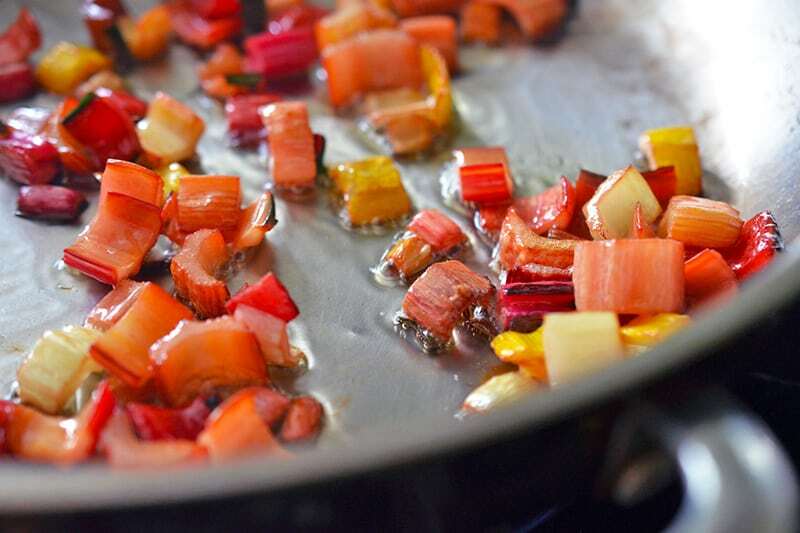 When the fat’s shimmering, add the stems with a sprinkle of salt. Sauté until tender. Drain the plumped raisins, and toss ’em in. 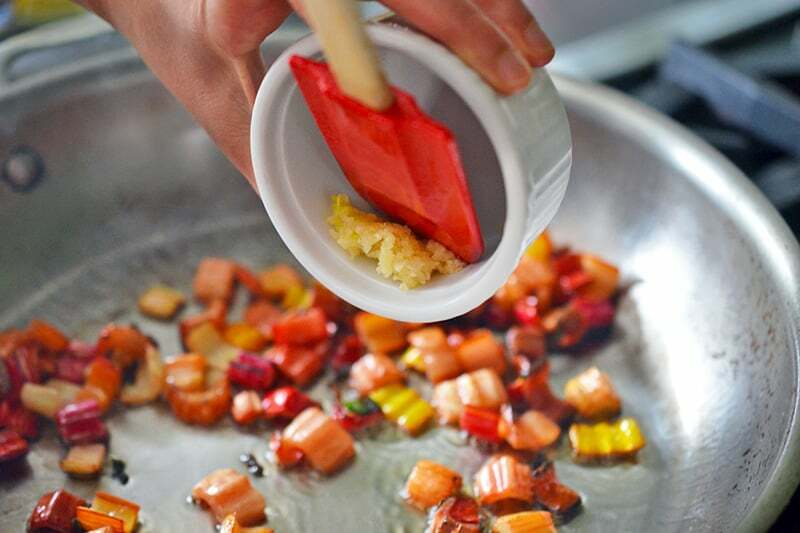 Give everything a good stir, and cover the pan. Decrease the heat to medium and cook, covered, for 2 minutes or until tender.